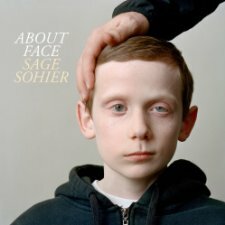 Professional photographer Sage Sohier spent 3 years in a Boston ENT clinic photographing patients suffering from facial paralysis along with family members. These intimate portrayals document the personal struggles patients with facial paralysis go through that is shared with family. Patients shown include children suffering from this malady. Her collection of photographs include people with mild to complete degrees of facial paralysis, a condition that usually occurs on just one side of the face and can result from Bell’s palsy, cancer, stroke, accident, surgery, and congenital nerve damage. Sohier documented patients as they progressed through treatment capturing their progress over time, witnessing hope and excitement as they regained the ability to smile, speak, and eat. Her collective photos resulted in a book About Face as well as a showing of her photographs to be displayed at the New York City Foley Gallery on April 17. Learn more about facial paralysis here. The BBC recently printed a story describing a rare condition called mal de debarquement which causes dizziness, typically after a boat cruise, though can occur with airplane flights and even a long drive in a car with switchbacks (going up/down a mountain). 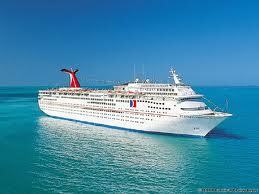 Two signs that a patient has mal de debarquement are if they feel a rocking sensation for weeks or months starting AFTER a cruise and two, if they're much better when in motion like vigorous exercise, but feel much worse when staying still. Unfortunately, no great treatment for this condition beyond displacement type exercises (walking, running, bicycling... but NOT on a treadmill or stationary bike). This condition was also in an article by the Washington Post in 2010. In this week's episode of "Girls," Hannah, grappling with OCD, inserted a Q-tip deep into her ear canal and "heard air hiss out the hole" due to perforating her eardrum. Although this scene came out of a TV show, this scenario is not uncommon and results in many ENT office visits every month. In fact, the word "ear" appears less than a dozen times on the entire Q-tip website. 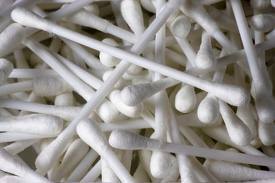 Apparently, Q-tips are meant for many other uses beyond ears which play only a very small role in the world of Q-tips. One of the most common questions I get after a surgical procedure is how long it takes before biopsy results are back... especially when a mass was removed and there is a cancer concern. Does it take a few hours? 24 hours? Days? Disappointingly, it can take up to 7 days if not longer. Well, rather than explaining, watch a 6-minute video that explains the numerous steps that goes into providing a diagnosis after a mass is removed... in this particular case, a neck mass though the same steps apply to any mass removed from anywhere else in the body. Special thanks to Robin Earl who spent hours hanging out in the pathology lab video-taping all the relevant video clips as well as Fauquier Health System for allowing this video to be made! 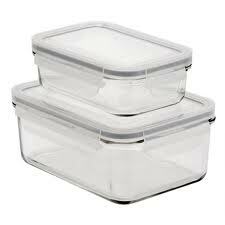 Have you ever closed the lid on an air-tight container containing a left-over hot meal and stuck it in the refrigerator? And than when you try to open the lid the next day once that hot meal cools down, it is REALLY hard to open the lid because of the accumulated negative pressure? In essence, the negative pressure has "locked" the lid down. Well, something similar can also potentially happen inside the ear with eustachian tube dysfunction, especially with negative pressure (rather than positive pressure). Eustachian tube dysfunction is a phenomenon whereby a person is unable to pop their ears to relieve symptoms of ear pressure, clogging, or fullness. It is much akin to the ear pressure a person experiences when flying, but at ground level. Traditionally, treatment of this condition involved medications like steroid nasal sprays and prednisone along with active valsalva (watch video below). Once medical treatment has failed, ear tube placement has been the step of last resort. It may be that the mucosal lining of the eustachian tube has swelled to the point that there is no opening present. There may also be a physical obstruction blocking the eustachian tube due to large adenoids, nasal polyps, or some other nasal mass. However, a lesser known phenomenon is due to the negative pressure itself creating a suction effect on the lining of the eustachian tube analagous to the stuck container lid mentioned in the first paragraph. The middle ear negative pressure itself may be literally "sucking" the lining of the eustachian tube closed. If the negative pressure is great enough, it may be very hard to get it open. When this happens, the eustachian tube becomes "locked". One can "mimic" this effect even in a healthy individual (not that anybody would want to try). When a swimmer dives deep into the water, some ear pain will start to develop due to the negative pressure building up in the middle ear. If the swimmer does not ear pop and continues to go deeper into the water, at around 3.9 feet, it may start to get very difficult to get the ear to pop open even with effort. At around 5 feet of water depth, it will become impossible to pop the ear open. Normally, swimmers and SCUBA divers continuously ear pop when diving at depth to prevent any ear discomfort. As such, in situations where negative ear pressure is present and medications fail to resolve the ear clogging, a hole can be surgically made in the eardrum WITHOUT tube placement which will often resolve the symptoms fairly quickly. The hole "releases" the negative pressure to allow the eustachian tube to function normally. The analogy would be that once you release the negative pressure within an air-tight container, it becomes very easy to remove the lid thereafter. 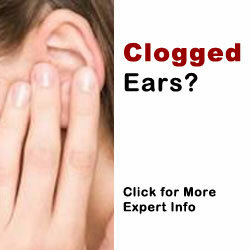 The eardrum hole typically heals closed in a few weeks and the clogged ear sensation will often not come back. If it does, the myringotomy (surgically creating a eardrum hole) can be repeated and if necessary, a tube can be placed to prevent the body from healing the hole closed anytime soon. Indeed, most people would rather get their uvula removed rather than "enhancing" it! 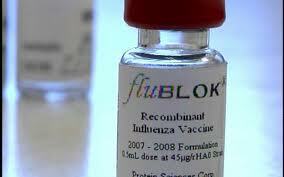 First there was Flucelvax introduced in 2012 and now there is Flublock, both considered egg-free for those concerned with egg allergy in traditional flu vaccines. Rather than being cultured in eggs, Flucelvax is cultured in mammalian cells and Flublock is grown in caterpillar cells injected by an insect virus containing the flu gene. Both vaccines are approved for use in people 18 years and older. Why the concern of egg-allergic patients with the traditional flu vaccine used to defend against both seasonal and pandemic flu virus? In spite of these reassurances, there are still concerns from patients and healthcare professionals which makes the availability of two different egg-free flu vaccines welcome news.